The Violence Intervention Program sees more than 18,000 victims of physical and sexual abuse and neglect each year. 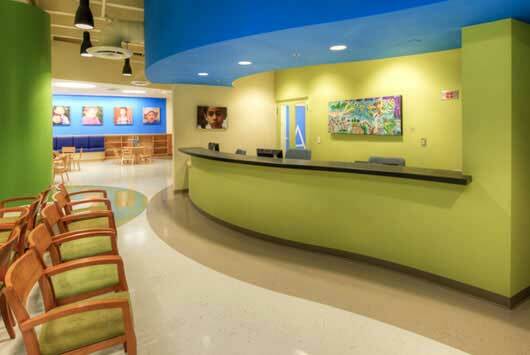 To minimize the oppressive environment of aging medical clinics, LCDG incorporated friendly, playful waiting areas for children. Acoustical tile ceilings were removed, and curvilinear flooring patterns and ceiling soffits relating to seating areas and reception counters, were installed. Light fixtures accent circulation flow, leading the eye to reception areas. Spaces are enhanced with a rotating exhibit of colorful paintings. The firm is currently rebuilding the oldest structure on the USC medical campus for VIP youth participants. The three-story building includes large reception areas, food service, counseling and offices. Occupancy is planned late 2016. On as-needed contracts for L.A. County, LCDG has provided architectural and interior design services for 45 projects since 2010.